While there might be an infinite amount of routes, patterns and possibilities, certain types of shots certainly seem to pop up more often than others. We asked BD columnist Mark Wilson if there are a few shots that you absolutely must have in your repertoire. During your next practice session, take a few minutes to drill these two shots. You'll be thankful, because they'll pop up sooner rather than later. This first shot is a common occurrence in 9-ball. 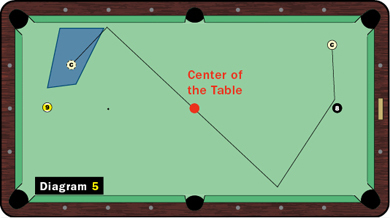 As we see in Diagram 5, the 8 ball is down near the center of the short rail, while the 9 sits in the middle of the other short rail, forcing you to move the cue ball the full length of the table. When the pros approach shots like this, they always try to minimize unforced errors and expand the margin for error. Depending on the shot, top spin or back spin (follow or draw) will be necessary in varied amounts, so you send the cue ball into the first rail at the correct angle that will send it through the center of the table and toward the long rail. (Remember: A that rolls through the center of the table from a rail can never end up in a pocket.) 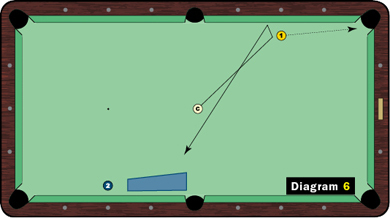 With this two-rail approach, your cue ball should bounce off the long rail heading directly into the position zone. Once you master this exact shot, slightly change the position of the object balls and cue ball. Experiment with top and back spin, always aiming to send the cue ball through the center of the table. Check out the next shot that spells trouble for a lot of players, shown in Diagram 6. This is a tricky position play that is common in both 8-ball and 9-ball. You're facing a 45-degree cut shot on the 1 ball, and you need to go across the width of the table to get straight-in on the 2 ball. When you send the cue ball across the table on this type of cut shot, the side pocket becomes very dangerous. Any small mis-hit or slight inaccuracy in pocketing the 1 ball can leave your cue ball headed for a scratch in the side. If that's not hard enough, we're focused on leaving the cue ball on the left side of the side pocket (the blue zone). This is a common position shot that, although troublesome, must be rehearsed until you reach a certain level of comfort and confidence. Try to avoid using side spin, which might be your first inclination. Rather, learn to use varying amounts of top and back spin reduce the number of variables involved with this shot. It will also increase your consistency from table to table. With practice, you'll develop a feel for pocketing the 1 and sending the cue ball toward the position zone.